Detector modules, into which the entire drive electronics have been integrated, were developed to facilitate the application of detectors. PIN modules and APD modules are available along with intelligent sensors which are – thanks to their interfaces – ready for application in Industry 4.0. Symmetrical photodetectors are required to measure differential optical signals in fiber-optic sensor systems and systems for optical coherence tomography (OCT). Symmetrical InGaAs photodetectors, also referred to as balanced detectors, are used in fiber-optic applications in optical coherence tomography and fiber sensor technology. Mach Zehnder interferometers are also available with integrated symmetrical detectors. The BPD-002 model is characterized by easy handling and high performance and is designed for applications in research and development. This symmetrical receiver is fully housed and, therefore, suited for both laboratory and commercial applications in optical coherence tomography and fiber sensor technology. OEM version of the symmetrical photodetector that is integrated into measurement systems and used in optical coherence tomography and fiber sensor technology. 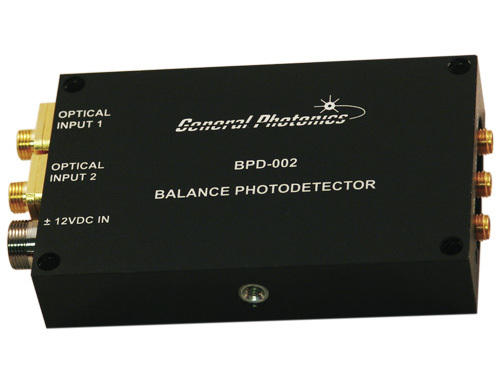 With this module, the polarization of the optical signal can also be determined. This device features a large bandwidth.